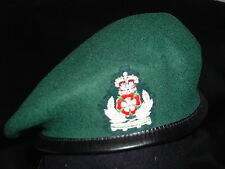 Original raf beret with cap badge. RAF Officers Beret with Gilt metal QC RAF badge .Beret in VGC - Size 58 . Beret in VGC - Size 58. Age unknown - fairly modern by look of label. ( 99 in serial number may imply 1999 ?). May need a quick brush but looks in good order. Rest of World £9.00. ROYAL AIR FORCE PILOT OFFICERS STYLE WW11 KINGS CROWN CAP & BADGE GOODWOOD (59). So Go On Look the Biz. A Royal Air Force Pilot Officers Style WW11 Kings CrownCap & Badge. A New Condition & Well Made Royal Air Force Pilot Officers WW11 Kings Crown Cap and Badge. RAF Royal Air Force Man's No1 Dress Cap. Size 57cm (Medium). ROYAL AIR FORCE MAN'S NO1 SERVICE DRESS CAP. In RAF blue/grey with black cotton centre band, embroidered front badge, plain black side buttons and vinyl chin strap. There may be a delay in responding to enquiries sent outside of these hours. ROYAL AIR FORCE BESPOKE CAP WITH A BLACK WOVEN CAP BAND (57-ZA). A Very Good to Unworn Condition Royal Air Force Style Cap with a Black Woven Cap Band. A Royal Air Force StyleCap with a Black Woven Cap Band. So Go On Look the Biz. A Very Good Used Condition Royal Air Force Beret & Beret Badge. ROYAL AIR FORCE CAP & BADGE (55-Z8). ROYAL AIR FORCE BESPOKE CAP WITH A BLACK WOVEN CAP BAND (56-ZC). ROYAL AIR FORCE BESPOKE CAP WITH A BLACK WOVEN CAP BAND (56-ZB). ROYAL AIR FORCE BESPOKE CAP WITH A BLACK WOVEN CAP BAND (57-ZD). ROYAL AIR FORCE PILOT OFFICERS WW11 STYLE KINGS CROWN CAP & BADGE (58-59). A New Condition & Well Made Royal Air Force Pilot Officers WW11 Style Kings Crown Cap and Cap Badge. So Go On Look the Biz. ORIGINAL OLD ROYAL AIR FORCE BERET & BADGE. SIZE 55 CM RAF. ORIGINAL OLD ROYAL AIR FORCE BERET & BADGE. SIZE 57 CM RAF. ROYAL AIR FORCE CAP & BADGE (55-Z5). A Good Condition Royal Air Force Cap and Badge. A Royal Air ForceCap & Badge. So Go On, Look the Biz. 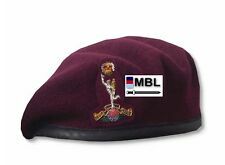 A Very Good Used Condition Royal Air Force Beret & Beret Badge It shows a label size of 60cm but probably a good 59cm. ROYAL AIR FORCE CAP & BADGE (56-Z4). A Very Good Condition Royal Air Force Cap and Badge. A Royal Air ForceCap & Badge. So Go On Look the Biz. ROYAL AIR FORCE WOMEN OFFICERS CAP & CAP BADGE (57). A Very Good Condition Royal Air Force Woman Officers Cap & Cap Badge. ROYAL AIR FORCE WARRANT OFFICERS CAP & CAP BADGE (54). In Very Good Condition Royal Air Force Warrant Officers Cap & Cap Badge. Military NO1 Dress Cap Badge. Gold Colour Embroidered Military NO1 Dress Cap Badge. Queen's Colour Squadron. Queen's Colour Squadron On Ceremonial Duties/Parades/Displays etc. British Royal Air Force. Pick up by hand is always an option. ROYAL AIR FORCE BANDS WOMAN'S CAP & BADGE (54-Z). A Very Good to What Looks Like Unworn & New Condition Royal Air Force Bands Woman's Cap and Badge. A Royal Air Force Bands Woman'sCap & Badge. So Go On Look the Biz. ORIGINAL OLD ROYAL AIR FORCE BERET & BADGE. SIZE 56 CM RAF. LEATHER CAP BADGE MOUNTING STRIP. BLACK LINING. ALL BERETS BERETS ARE MADE TO UK MOD. ROYAL AIR FORCE WOMEN OFFICERS CAP & CAP BADGE (52). Like New Subsequently In Very Good Condition Royal Air Force Woman Officers Cap & Cap Badge. New boxed item still in white bag, sealed box only opened to photograph. RAF Flying Headphones/Down Leads/Nato Plug, they are in good used condition but untested. Unknown RAF badge. This is probably a cap badge - fitting two lugs. Size 58 Beret & Badge. 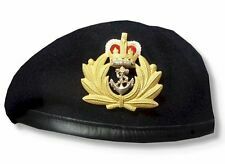 Military NO1 Dress Cap/Beret Badge. Warrant Officers. British Royal Air Force. Military NO1 Dress Cap Badge. Warrant Officers. British Royal Air Force. Authentic Finnish Airforce officer M65 field cap, its in good used condition, its around a size 58. Authentic Finnish Airforce officer M65 Winter field cap, its in good used condition, its around a size 58.